Shortly after I posted a letter from Congressman Dennis Kucinich a few days ago, he dropped out of the race for president. 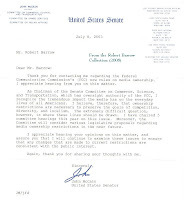 Though I'm quite sure there was no connection, I decided to post my 2003 letter from Senator John McCain today simply to determine whether political lightning strikes twice. Wouldn't that be interesting? No, I don't really believe that, but I did have a letter from Sen. McCain and thought it topical enough just to feature here. Again, no UFO issues are involved, but I did raise questions about how much conglomerate media ownership is enough in this country. His office's response was typical stuff, but here it is for your viewing pleasure. So, is he still running, or . . .? ADDENDUM: Hmm, several days have passed and my experiment appears to be flawed. Senator McCain has not given up his quest as presidential contender. Of course, I could argue that including his name on this blog actually cemented his chances. Wouldn't that involve the "fuzzy logic" approach? The Aerial Phenomena Research Organization (APRO) wasn't perfect. No UFO organizations ever were. A major blunder on Jim and Coral Lorenzen's part involved an initial negative polygraph reading in the alleged Travis Walton abduction case, though Walton passed the next test. The Lorenzens apparently tried to downplay, if not withhold, results of the first test, probably hoping another could be completed under circumstances they felt more favorable. Their attempts backfired and gave such debunkers as (the late) Phil Klass additional ammunition for his continuous anti-UFO rants, and respected "pro-UFO" researchers expressed their own disappointment. Yet, much of the time the people behind APRO weren't afraid to take a stand, even if it flew in the face of other investigators' beliefs. This is precisely what occurred amidst the furor over the famous Cash-Landrum UFO incident. Many of you know by now that I don't like to rehash details of cases easily and readily available via other Internet locations, so I urge you to direct your efforts to other sites, such as the ones I link to in the margin. The July, 1982 letter from Coral, displayed here, overflows with her rage on this particular day. For one thing, she expressed disdain that some UFO investigators, as well as ABC-TV's "That's Incredible" TV show, were turning what (to her) seemed a purely government "test vehicle" situation into a UFO puzzler in which military aircraft accompanied an actual UFO through the skies. The Cash-Landrum incident was especially striking because of radiation-like symptoms endured by civilian witnesses who viewed the encounter. This aspect proved sad and tragic from any point of view, but Coral was not about to leap on the potential UFO aspect when something experimental involving our own government would do nicely. But this letter winds around a number of issues in addition. 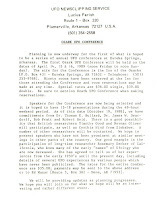 Coral, never a fan of the organization MUFON (regarding, particularly a former director, whom she obviously references here and, indeed, routinely and not at all fondly refers to in various letters as "old motor mouth"), was already involved in writing a long, long letter of refutation about the Cash-Landrum situation to a MUFON professional investigator, who responded with an equally lengthy document (which I have seen). Here, she also takes the opportunity to criticize both MUFON and the Center for UFO Studies, bemoaning the effectiveness of UFO conferences and MUFON's selection process for state director positions. Yes, this is a very, very angry letter, but this also took place during a period of several years when Coral was becoming extremely jaded about "personalities," as opposed to the hard workers exploring the UFO subject. I really don't want to fill in any additional holes about the comments she makes in this letter, but most of you familiar with APRO and with UFO history can probably draw your own conclusions. Of course, the eighties additionally became the decade when APRO's influence started to slide into the same pond of controversy and change that claimed NICAP years earlier, though I hasten to add that reasons for the demise of either were dissimilar. In APRO's case (as further personal correspondence will demonstrate in the weeks to come), its inevitable downfall seemed -- and was -- as natural as life, illness and death itself. 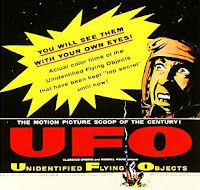 More About the 1956 Movie, "U.F.O." Readers, as noted previously I do intend to start a separate blog about the 1956 United Artists documentary motion picture, "U.F.O." I still don't know when or where on the Net, but I'll certainly keep you informed here. I do have a lot of correspondence from the late Tom Towers, who played the role of Al Chop in this obscure film, and I hope to post all of that, in addition to letters from other key participants. Finding things is half of the work, of course. To my amazement, under Towers' name on the IMDB Web site, additional personal information has been posted by somebody about his life. I only posted the blurb about his involvement with the movie on this page which at first offered no other information whatsoever besides Towers' name, and I haven't been back to that page for a year or so. However, when I checked it about a week ago I was surprised to find updates by a person or persons unknown. Somebody obviously close to Towers added his birth date, place of birth, date and location of death, his Army entrance data -- and even noted how tall he was! I left a message, hoping that the updating person would contact me, because it almost seems certain that a surviving family member included the additional data base. But I wouldn't be surprised if a one-time entry occurred and that the mystery updater is long gone. In the meantime, should you wish to read more about this motion picture, there are still links over at nicap.org (see link in margin), and all you need to do is type in my name into the NICAP search engine and two separate articles on the film may be accessed. Some of you, "longing" for a more recent photo than the one I shared during the first few months of this blog, will now have your wishes fulfilled and your expectations tarnished beyond repair. Yes, in today's entry I give you . . .me. Why encourage the curious at My Space to drool over these charming images when I can simply post them here for the world to see? Hey, pretty darned hot stuff, huh? Modesty overwhelms me. But. . .seriously, in way of explanation: The tiny 1968 image is my Air Force basic training photo at Lackland AFB, TX, smile neither included nor expected. The photo portrait from 1970 was made off base, shortly after I achieved the rank of sergeant at Sheppard AFB, TX, though I had no intention of wearing a uniform for the picture that day. 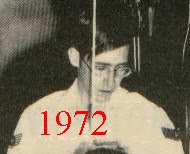 The 1972 photo (for a larger and better version, a product of the base newspaper, see my Air Force blog, linked in the margin) was snapped at Moody AFB, GA, where I operated my own physical therapy clinic as a staff sergeant, a rank I attained with only two years and 11 months of service (yeah, that surprised me, too). 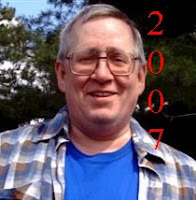 Finally, there's a 1990 photo in which, at last, I look almost human as a civilian -- and, yep, gaze your eyes upon that 2007 photo, R. Barrow himself, older, wiser and. . .well, we'll stop there. Anyway, that was my outdoors look, appearing so in touch with those trees in the background that I'm lucky a critter from the forest didn't carry me off and try to feed me to some squawking thing in a nest. Well, I guess I was naughty or something. I previously posted an entry to point out the relationship of early U.S. moon missions to products used in space and advertised heavily by their manufacturers. A few days after I posted this brief piece, however, I was somewhat aghast to find that somebody (affiliated with Blogger, I assume) removed both visuals accompanying the entry. The visuals were scans of an early seventies ad for a popular antihistamine, a brochure commonly sent to doctors and public institutions all over the world. It was MEANT to be seen by anybody and everybody, so as hard as I try to respect copyrights on this blog, I have to say -- I don't believe this material was beyond display here. Like flashers in raincoats (to put it crudely), corporations print these advertisements in order to show us what they've got. In any event, the entry text itself remained intact here, but I pulled it. In return, I'm posting this with just appropriate snippets of the advertisement shown, without any reference to the product itself. Frankly, I believe the pharmaceutical company would welcome the ad's display in terms of historical significance, but I suspect that Blogger/Google felt I overstepped their policies in some way unrecognized by me, and I'm only sorry that I can't share this very relevant bit of non-UFO nostalgia with my readers in full. The moon/space references are of interest because the late sixties and early seventies (this ad was from 1971) marked a whole new era in the history of exploration -- whether in space or amongst Madison Avenue's ad personnel. Like so many others on a growing list, UFO researcher Cynthia Hind is deceased (2000). Her major influence in UFO history was to make the world aware that her native Africa is as rich a place for UFO sightings as the rest of the planet. I did review her book for Pursuit, though the review's original destination had been a great little magazine called Frontiers of Science, which folded whilst the review perched on the editor's desk, just weeks away from publication. Cynthia's letters from 1982 and 1983 will offer a little of her background and accomplishments, though a few typos will give pause (for instance, that one entry should be Arcturus Books. . .). Her reference to my reference regarding women in UFO research arises from my mention that their prominence in UFO research at the time seemed far outweighed by men, at least in the literature. I appreciated her skepticism about the long-time "contact" story (I never saw the book), and the few words she offers about the African workers' UFO encounter is very interesting. If not for a narrow band of dedicated UFO researchers scattered amongst the lesser anticipated places of the world, UFO history would truly thirst for knowledge proving that the UFO is a universal and legitimate phenomenon. Somebody (I'm sorry I don't recall whom) sent me this highlighted copy of a 1984 letter sent to another by the late Sen. Barry Goldwater. I had no reason initially to doubt its authenticity because Goldwater made similar statements on numerous occasions in which he would decry results of his attempts to learn more about UFOs via official channels. Based on other letters out there, this would be a typical Goldwater response. His military career and contacts also influenced his views on UFOs, information that can be found readily on reliable Web sites. NOSTALGIA: By coincidence, I also happened upon Lou Farish's original bulletin for the conference's 1989 premiere (displayed here for old time's sake!) and he has successfully organized these proceedings for two decades now. This is amongst the nicest and most detailed letters I ever received from an Air Force public information officer, in response to a sighting and witness I inquired about. Griffiss AFB in Rome, NY, a Strategic Air Command (SAC) facility, was closed down several years ago, but the base was the obvious source of numerous UFO reports in its day. In 1982 I was sent a helpful package filled with Air Force bulletins and even a glossy photo of a fighter jet. I think this was a period when the post-Vietnam military was really trying to update its image to appear almost cuddly and friendlier to potential recruits and the public. Note the "Peace is our Profession" statement at the bottom of the letterhead. How things change. I believe that the logo in force when the military draft came after me in 1968 was, "You're Coming With Us Now!" Of course, the officer felt obligated to include the usual Air Force no-no-UFO statements (pay no attention), and I would certainly take issue with the oft-repeated official assurance that no evidence was found of a technology beyond our own scientific knowledge. What makes us think we would recognize a technology advanced beyond our own? I also suspect quite a number of military and airline pilots with UFO encounter experience would have a little trouble with that proclamation as well. They saw the "evidence" for themselves. I don't pour myself a big cup of conspiracy juice each morning. No, I don't believe our government brought down the World Trade Center. No, I do not believe we faked the moon walk that I watched with great anticipation, joined by fellow airmen at an Air Force base. Are there political conspiracies? Of course, remember Watergate? If we look for a conspiracy behind every rock, they aren't hard to find, but the problem with many of them is that you'll never know the circumstances for sure. And what might seem conspiratorial can actually be silence about or nervous avoidance of a subject simply because the people charged with knowing about it find themselves clueless. What do you tell inquiring minds when anything you say will emphasize your lack of knowledge or inability to obtain it? Sometimes, it's more appropriate just to shut up and move on. Conversely, if one does know something, it can likewise be appropriate just to shut up and move on to another topic. You who read this blog (and I thank you profoundly for returning, as I attempt to create something of historical significance here) have seen my references on a couple of occasions to The Temple of Nevermind. It's not a physical place we can visit. The Temple is a sacred though somewhat vague aspect of government, a term I threw out there a few months ago to signify instances where we might just feel that the answers we get aren't exactly the answers we want, even though we might be thrown a crumb of information. Sort of like a child approaching an adult for a response to some seemingly legitimate question, yet the adult reacts with, "Oh, you don't need to worry about that, why don't you just go outside and play a game?" Or, "Someday I'll explain it, when you're able to understand," Or, "That's really none of your business." Or, the best of all -- "Never mind." "Never mind" isn't a term that needs to be stated, just implied. "Never mind" need not be laid out in front of us rudely, when one can simply ignore the issue at hand or respond to only part of an inquiry. The Temple is a 24-hour operation in a free/not so free government. Fortunately, it serves a necessary purpose in preventing enemies access to national security data. Unfortunately, The Temple isn't really anybody's best friend. Not when you want to know what there is to know and you believe it's your right to know it. The Freedom of Information Act. National security. Homeland Security. Need to know. Need to not know. Your right to know. You're wrong to know. We're in hell. About that "our children are the future" thing? Maybe not, maybe something else is the future, just as something else was the past, and the rest of us merely wander through the time of day in blissful ignorance. The Temple of Nevermind never, ever closes, dutifully serving up its oddly flavored concoctions, twenty-four/seven. In The Temple, there are no conspiracies, just gaping holes where answers to questions used to be, might have been or should have been. The right questions are rarely asked, anyway. Who could possibly be faulted for an absence of knowledge in The Temple? Nobody. Never mind. We'll leave that strangeness for the moment to concentrate, at last, on the rest of today's entry. Once more, the presidential elections are upon us in the U.S. That's why I'm making a topical and temporary jump in my blog entries from the early 1980s to 2002, the year I received a letter from Congressman Dennis Kucinich, presidential candidate. Today I have posted (see) my two-pager to Rep. Kucinich and his eventual reply and, as you will see, it isn't at all about UFOs. At that time, I was very intrigued with Kucinich's "peaceful use of space" legislation. However, now that major nations have announced in a cut-throat manner a virtual race to space on each's own terms, and in consideration of the fact that the Chinese, for some bone-headed reason, recently jeopardized near-earth space by carelessly blowing up one of their space satellites, it's obvious that space may indeed be destined particularly to host a very large cache of debris and weaponry, at least for the "short" term. Peaceful use? Good luck with that, Mr. Kucinich. 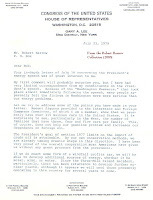 In his letter (see), Kucinich addressed the peace issue. However, his office totally disregarded the rest of my letter. In July of 2001, Hartsville, TN radio station WJKM, a nearby newspaper office and an abundance of electrical equipment reportedly took a tremendous hit of destruction in association with a bright flash of light. Even dead and dying birds fell from the sky, appearing burned, some with what appeared to be melted wings. Whatever happened, an incredible burst of energy was involved. As you can see in my letter, military involvement was not out of the question, nor was it necessarily responsible. For months after this incident, the folks from WJKM and nearby facilities were still searching for answers. Radio station personnel put the whole thing up (including pictures) on the Internet for the world to see. I hasten to add that explanations have since emerged and the whole thing may indeed have a conventional cause. Or not. Or possibly. Despite a mention in some depth of this incident at that time, however, the response from Kucinich's office omits any reference to my inquiry. Obviously, I had hoped for some little tidbit of enlightenment, but all I received was a legislative puff piece. Too crazy for a word or two? A bother? Surely, the Hartsville, TN event required something in the way of explanation or degradation or dismissal or referral because of. . .? Well, so much for that. As if a question about that other mystery, Chicago's O'Hare Airport unidentified aerial object, asked of his office would elicit a better reply? Of course, neither Tennessee nor Illinois happen to be part of Rep. Kucinich's Ohio, nor was I, so maybe that's the reason why my concern remained unaddressed. In every way. Now, changing the subject and returning to that other line of thought for a moment: By intention, accident or design, The Temple of Nevermind is always there for us, an innocent and generally indescribable public service beyond controversy and eminently non-conspiratorial. So hush up, let's just run along and play a game now, any game we like, as long as it keeps us out of the way. You probably know that Don Ecker and his wife Vicki churned out UFO Magazine as a labor of love for 20 years (since 1986), until they recently retreated from the world of UFOs -- rather disheartened with the evolving status of UFO research -- and left the publication under the care of others. Don compiled an extensive look back at their UFO research years, with some interesting photos sprinkled throughout. Everything is assembled conveniently in a .pdf file and available for your viewing now. The .pdf may be accessed at UFO Watchdog by following this link: http://www.ufowatchdog.com/ufo_fog.pdf --Sorry Readers, I had the link incorrect and have since corrected it, now as shown here. In the early 1970s, parts of Missouri seemed awash in UFO sightings and, taking a stance against the historically negative grain of UFO opinion evident whenever academia usually became involved in those years, a team of scientists from universities in Missouri actually approached the situation with open minds instead of derision and catcalls. Dr. Harley Rutledge (deceased), chairman of the physics department at Southeast Missouri State University, joined with various colleagues to initiate "Project Identification," an ambitious attempt to determine what was going on via the use of high-tech tools out in the field (even ultrasound detection equipment, which raised an eyebrow for me because I had written an article for APRO in 1971, theorizing the possibility that UFOs may incorporate ultrasonics, and I suspect that article played a role here). Eventually, as former UFO skeptic Rutledge professed in his 1981 book, Project Identification, the team came to the conclusion that UFOs were real, intelligently controlled and seemingly intent upon revealing their existence to us, albeit ever so slowly. 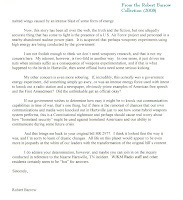 As Dr. Rutledge's letter (shown here) attests, I gave it a glowing review for the journal, Pursuit, as, by the way, did the Aerial Phenomena Research Organization for its own journal, The A.P.R.O. Bulletin. However, Rutledge's book was hardly accepted with applause by UFO research notables such as Dr. J. Allen Hynek, nor by other prominent investigators who still continue their efforts to this day. I already knew before writing the review, and stated within it, that Rutledge was destined to be attacked by well known UFO researchers -- a situation almost unparalleled, as one would usually expect that scientists on basically the same UFO investigative "path" would be more supportive of one another. Yet, I expect Rutledge's "in your face" conclusions spooked numerous people, even those of a similar hypothetical mode. Of course, though his detractors were fellow scientists, I'm just a writer trying to make sense out of the information available to me as a layman. But in a May 20, 1982 letter sent to me by Dr. Rutledge, just a day prior to the one displayed here, he did raise a few points in his own defense. 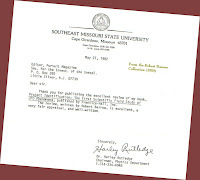 At one point in his letter, Dr. Rutledge states that he "very much" liked my sentence, "In the best scientific tradition, he (Rutledge) tells the Missouri UFO story step by step, carefully examining pieces of the puzzle until he comes up with some ultimately irresistible conclusions." Elaborating on this statement, he writes, " I was assailed for this by reviewers you so aptly describe. . .Actually, I wanted enough science in the book to give it validity while maintaining an interesting story of true adventure. I certainly think some critics were too harsh with regard to the scientific presentation; I know of no other book that goes as far that is written for public consumption. "Actually," continues Rutledge, "I had placed most of the technical developments in seven appendices, but (Prentice-Hall's editor) wanted them up front. It may have been a mistake; the average reader is probably intimidated by the equations. "I was pleased that you mentioned the 'vague rumblings' in your review. I was forewarned that (Rutledge mentions four prominent UFO researchers' names here, all significant for their science credentials) were 'out to get me.' First, they were going to show that I falsified data on the word of someone who worked in our Project. I dared them to try. Then, they were going to show that I could not have remembered the details of all those sightings. Of course, I have a shoebox full of tape recordings made in the field. But keeping records and trying to direct 40 different participants was a terrible task. And there was a paucity of funding. "I did not respond to the negative reviews," advises Rutledge, "and do not plan any action. I have gone through in detail the review. . .in the (CUFOS) International UFO Reporter. Refutation was so easy that it was obvious to me that it was a character assassination rather than a book review." The lesson for me here is that the UFO is a legitimate and complicated scientific mystery, with implications so deep and so strange that even the science folks get caught up in the chaos of attacking one another as they attempt to get a handle on that which can't yet be handled. There's the scientific method, and then there's the other scientific method. Scientists are people, too. The Christmas season of 1980 arrived, and the mailman delivered a daily assortment of greeting cards. Every Christmas for several years, I had received a routine card from Syracuse Congressman Jim Hanley and his family. Oh, I know what you're thinking, it's not unusual for members of Congress to send their constituents greetings this time of year -- except, well, you know, somewhere in his office I must have become known as "that UFO guy," and surely would have been an ongoing annoyance to at least somebody on the staff. Good grief, my presence had been felt in that office since the mid-sixties. But even I, that UFO guy, received a nice card every year from the office of a man who suspected there was something to this business of UFOs, even if he couldn't do much about it. However, for starters, Hanley was directly responsible for obtaining many of the official documents I've scanned, presented and/or referenced in this blog. His letters of encouragement (see a couple of them here) over the years, whether simply expressing an interest in the UFO subject or extending a warning about being too open concerning my interest in the topic during my Air Force enlistment, meant a lot. This Christmas card, however, would be his last, for this was the year he announced his retirement from Congress, aptly stated in the card's message (see). As usual, the card was signed with the names of he, his wife and son. When the new federal building was constructed in Syracuse, it was named the James M. Hanley Federal Building, in tribute to the man who did so much for Central New York, a member of Congress who left his profession as an undertaker to represent his people, the uncommon common man praised for his integrity and never enveloped in so much as an ounce of the scandal that one almost expects these days from some amongst the Washington flock. 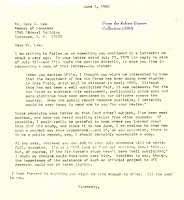 And the recommendation, his advice that the Carter Administration consider me for a UFO study (see letters in recent blog entry), should one have been in the works: I can hardly believe to this day that he submitted my name, no matter how improbable the likelihood. 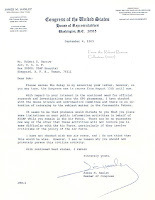 I thanked him numerous times in letters for information he and his office provided. Still, I never met him personally, so I was really just another constituent, a name without a face. I expect that I was treated no differently than others who wrote for assistance, and therein probably lies the key to his longevity in Congress. Truly, we whom Jim Hanley represented were all considered equal. The former congressman died a few years ago. There was little to do, but to leave a few words in an online family obituary guest book. I simply wrote that Jim Hanley had once done an incredible kindness for me. Actually, he had done many, but the ultimate, that recommendation, was the one I'll always remember vividly because of the "what if" factor. What if? Hello Again, U.S. Secret Service! 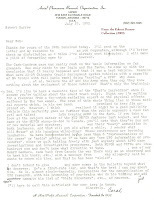 One of the earliest entries in this blog last year concerned my encounter with the U. S. Secret Service in the late seventies, after The White House apparently received a charming letter threatening President Carter in some way (I never saw the letter), and several names of innocent people, including mine, appeared on the document. The people -- oh yes, I'm pretty certain I know who originated this brilliant project -- who perpetated this recreational activity had no way of knowing my congressman had already recommended me for a position with the Carter Administration in the event that a new UFO study would begin (it did not), so maybe it should have been obvious that I wouldn't be inclined to bite the hand that might feed me a UFO gig, you know? That matter was settled in short order and all of us whose names were involved were cleared and, though I don't know what happened after that, I'm hoping all hell broke loose if the "write" folks were located. Maybe they weren't. In those years of "The Letter," there would be a peculiar event here and there. For instance, one night during the wee small hours I awoke to a ringing phone, and upon answering a person claiming to be calling from a hospital informed me that family members had experienced a serious auto accident, and I needed to get to the hospital right away. The call was a hoax. On another occasion, the very people whom I always assumed responsible for the letter and other such mischief were caught stuffing mailboxes with racist literature. This time, the police nabbed them. And, just what I needed, then came this latest work of art. In 1980 Coral Lorenzen sent me a copy of a letter received at APRO, and at the top of the original she had written a notation for her office staff to "File under 'Nut.'" I sure hope there was room left in that file because this letter was a gem. I've reproduced it here in very small size because I'd rather you not actually read it. The letter concerned only one subject, me, and the writers accused me of some very strange things and professed knowledge of unsettling things about me. Since they didn't really know me, their fictitious ramblings were simply outrageous and annoying. Like most hate letters written by the imbeciles of the world, the spelling was hideous, and of course there was no signature or return address, only APRO's address at the top and bottom of the envelope. In a follow-up letter (see), Coral realizes I suspect the writers' identities (oh yes, more than one...), and she also mentions wearing a brace (she had tripped over the family dog and sustained a severe injury that would burden her for years). By 1980, I was sick to death of the bunch I assumed responsible for this letter and other actions I suspected, so when this occurred I took the letter almost immediately to the local Secret Service office so they could make a copy and, I hoped, would stay interested. If you look closely at the page displaying the envelope, in the upper left you'll see the faint blue stamp of the U.S Secret Service office acknowledging receipt of the documentation. Once again, I don't know the outcome of all this, but I do know that, as years passed, one of the people I suspected from the start perished in a very peculiar death-by-fire situation that he seemingly initiated himself. The details of this bizarre event appeared in newspapers. Another potential member of the guilty parties also ended up in a bad situation, though still living, if a search I performed on the Internet was correct. The problems I encountered with these people ceased at last, and their brand of childishness -- at great cost especially to themselves -- never returned. And I really hope to never, ever have to visit the Secret Service office again. I suspect they have enough to deal with. After all, who do you think is charged with the grave responsibility of flying those mysterious black helicopters? Uh huh. 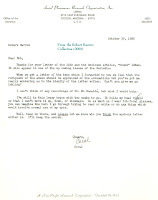 Betty Hill, of the famous alleged Barney & Betty Hill UFO abduction case, replied to a letter I sent her in 1980. A few days before, she and a who's-who of well known UFO researchers participated in a classic solid week of UFO discussions hosted via an evening talk show on Rochester, New York's WHAM Radio. Many of the participants actually appeared personally in the studio. This is the program to which she refers. Aside from the abduction experience claimed by Betty and her husband (both deceased), updated by her niece in a recent book which I have not seen, there has long been concern by researchers about Betty's belief that she subsequently experienced UFO sightings on a regular basis. I'm thinking back vaguely to instances where people in her presence would try to assure her that some lights in the sky were nothing unusual, but she was insistent that they were spacecraft from elsewhere. She obviously takes a stand on this issue in the letter shown here. In any case, if you aren't familiar with the original Hill incident, know that the story itself, the couple's later hypnosis sessions with noted psychiatrist Dr. Benjamin Simon, and the eventual "Hill Star Map" constructed by teacher Marjorie Fish, which literally lifted the Barney and Betty Hill incident's credibility through the roof, are the essentials of this enigmatic situation. As a member of NICAP and APRO when the Hill story first emerged decades ago, I remember my fascination with this incident, for this was the first "abduction" case to impress NICAP, and it certainly raised the stakes for APRO, which had followed similar international reports for years. If you ever have an opportunity, be sure to see the seventies TV movie, "The UFO Incident," a dramatization of the Hill case based upon author John G. Fuller's book, The Interrupted Journey (which also must be read for an appreciation of the Hill's story). Actors James Earl Jones and Estelle Parsons provide superb characterizations in this disturbing motion picture. Robert, Why Do You Do That Thing You Do? A question has been raised: Why do I label most scans appearing here with the words, "From the Robert Barrow Collection?" Well, in basic terms, I do that because I'm arrogant, egotistical, possessive, jealous, self-centered and just crazy about planting my name on everything. It's sort of a male-dominance thing, I suppose. I'm even thinking about putting a tattoo of that little announcement on my forehead, and eventually seeking out all my readers and insisting that you, too, inscribe those words permanently on your faces (yes, they could appear in other areas, but I really want them to be visible at ALL times). I once worked in public relations, and I know all too well the value of publicity and its ability to make the slimiest person on earth look like a god -- um, not that I'm comparing myself to a god (Robert Thor, Robert Zeus, Robert The Goddess Diana. . .yeah, well maybe that wouldn't work so great... ), or necessarily suggesting that I'm out there with the slimiest, of course. Beyond all of that, I'm simply branding my stock. I have absolutely no problem with anybody showing it off, as long as permission is requested. Some of you have been kind enough to ask, but others -- such as some notable twits in Germany who have seen fit on at least two occasions to reproduce my entire entries on their own blog, translated into German with my name changed to whatever-the-heck-that-means at the top (they will recall that I had "a word" with them twice, leaving the future of their blog in question, depending. . .) -- have not. But truth be told, I really must thank veteran UFO researcher, historian and author Wendy Connors (see her Faded Discs link), who once sent me some compact discs of material she had converted into digital format from old tape recordings I loaned her. Wendy, whom, incidentally, makes the best-looking CD labels on the planet for the superb historical discs she offers, had labeled them with the phrase, "The Robert Barrow Collection." Thus, I shamelessly admit now that I merely stole the idea from Wendy, offering her no words of gratitude or just compensation at all. Hmm, I guess it's time to say, "Thanks, Wendy!" Hal Starr, now deceased, was a veteran broadcaster who hosted a syndicated series about UFOs carried by radio stations around the country. I don't recall a great deal about him right now, except he had one of those broadcast voices I would kill for. I always wanted to be a broadcaster and took courses toward that end in college. Alas, the Vietnam Era military and time's wear and tear took their course and the voice isn't up to par, but at least I can write a little (though some may disagree with my self-assessment). Hal, in charge of public relations for the Aerial Phenomena Research Organization for a time in the late seventies and early eighties, even put out a record album (also known as an LP for you folks who were too young to remember them, and still don't know what I'm talking about, nonetheless) featuring a few of his radio spots -- appropriately melodramatic, but certainly attention-getting, I must say. In 1979 he hosted a well-attended UFO conference called "UFO '79" in California and, because I was at that point doing book and audio reviews for various publications, I decided to inquire about audio cassettes he was selling to the public. These were destined to be very interesting cassettes because Starr had an "all-star cast" of knowledgeable UFO speakers at the event. Hal sent along a price list, but I really hoped for complimentary copies to review for publication. 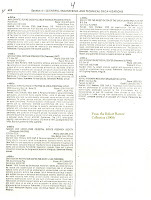 When I contacted him again, he very kindly sent me a loaner set intended for a paying customer, and per his advice I quickly dubbed the whole set and returned the tapes so he could make the sale to some unsuspecting second-hand buyer, and indeed I did review them for a couple of publications. In recent years I was happy to turn them over to Wendy Connors for conversion into digital format for her immense Faded Discs historical collection before they went the way of most tapes -- to the land of deterioration and extinction. By this time, I doubt that almost anybody would still possess copies of these important historical recordings, and by Hal Starr's own admission, he hadn't had orders for very many sets. Dear President Reagan. . . True, very true, the congressional recommendation sent on my behalf to President Carter's people didn't lead to anything, but you can't blame a guy for trying next time a new president came to town. 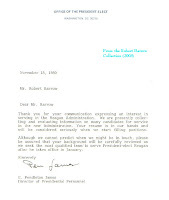 I inquired about a position in case UFOs were on the agenda (Grant Cameron, I believe this is your territory at Presidential UFO. . .by the way, readers, do check out his link) in the Reagan camp. I guess not, or at least they didn't tell me President Reagan was doing a UFO project. They would have told me right away if so, wouldn't they? Wouldn't they? Why wouldn't they? Sure they would . . .wouldn't they? There exist piles of correspondence inappropriate for this blog, particularly in cases where people are still living, and I do try to be sensitive to the obvious fact that family members of those deceased survive and might be affected by something I write or put out there for display. Keeping this in mind, I truly have questioned whether I should run the letter from the late Coral Lorenzen shown here. By accident, I discovered that Coral's sister died recently, and I'm all too aware that family members live on as their lives take their own course. So, what do I do? 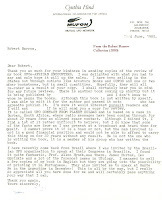 This letter is now nearly 30 years old, and I'm thinking, well, I've tried to offer something of a tribute to APRO's Coral Lorenzen in this blog. It's never been a secret that Coral disliked various UFO researchers, and some apparently felt the same about her -- though I hasten to admit that detractors' complaints often involved APRO's reluctance to share files and information with them. Actually, in today's letter Coral takes a swipe at both MUFON (her favorite target of all time) and CUFOS, but that was typical Coral, and I must confess that I heard a lot worse in phone conversations with her. However, getting back to the letter: Say what you will about Coral the UFO researcher, Coral the author of multiple books with her husband Jim and Coral the driving force behind APRO, the earliest U.S. UFO organization (1952) -- she was also a wife and mother. We already touched upon the year when Jim had emergency cardiac surgery and the nightmare surrounding that incident for Coral. 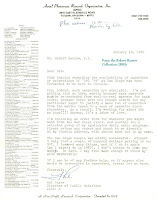 Then, in 1979, arrived this letter. Why show it here, filled as it is with family sadness and tragedy? Because Coral Lorenzen was a public figure, a multi-published book author known the world over. If I don't take this opportunity to reflect her family side for that world to see, who will? When history craves intimate details of APRO's foundations as time goes on, should it have been my role to hide the facts, or to put them out there for all to see? I've chosen the latter course. I think it's my responsibility, and I believe Coral would have understood -- well, maybe after a tirade of sorts. Jim Lorenzen would pass on a few years after this letter, and as Coral herself lapsed into decline in succeeding years, her daughter suddenly died, probably hastening Coral's demise profoundly. Some know all too well that behind the UFO story oft lies a human story -- each story special in its own way. 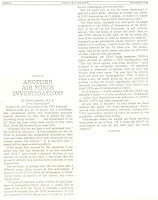 For the sake of history, I'll hold my nose and present these 1979 pages from the U.S. Air Force declaring the negative aspects of the UFO issue (in three sections). However, on behalf of all the military pilots from all branches of service, it sure would be great if we ever saw the day when our government would simply come forth and acknowledge the unexplained and sometimes dramatic UFO encounters so many experienced in decades past. Dream on. 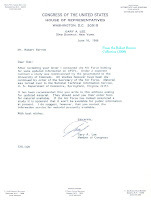 In June of 1980 I again contacted Congressman Gary Lee, hoping for new information about his surprising revelation concerning a possible new Air Force study on UFOs (see copy of my typewritten letter). His response proved something of a letdown, for he seemed to back off considerably from his original statement, and now referenced the University of Colorado study and other "ancient history" regarding official UFO interest. However, I did note with interest his comment about "if" the Air Force has conducted another UFO study (it wouldn't be available yet). Thus, what started out as a potentially dramatic prelude to a new Air Force conclusion about UFOs ultimately ended up as yet another postscript to a lengthy list of could-have-beens in the UFO arena. I was hoping for more. You were hoping for more. 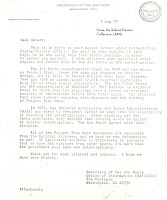 I intend next time to show you the 1979 response I received from the Air Force when I queried them about their current UFO interest. This, of course, I had done because of Congressman Lee's initial comments, without actually naming him as my source. 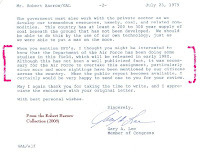 The 1979 response really doesn't vary that much from previous postings of Air Force UFO "fact sheets" offered on this blog, as you will see, but as an historical reference the USAF response really should be reiterated here in its 1979 version -- and, again, this was a time when they were apparently up to their ears in UFO inquiries from the public (even the cover letter was a photocopy with my name typed in, no personal replies here! ), perhaps because of a wave of UFO sightings similar to what we experienced in Central NY. I'll probably offer these pages in three separate blog entries (I have problems when I try to post too many pages at one time), so stay tuned. 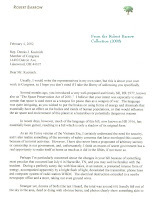 Long before now, assuming you haven't cheated by reading these blog entries out of chronological order (shame on you if you didn't start at April, 2007, where some really good stuff lurks), you probably believe that all the letters I wrote to members of Congress over the decades concerned only the UFO subject. It sure looks that way. But I also have files sprinkled with copies of letters to and responses from public officials about other topics, covering energy, the environment, crime, punishment, politics and a number of other common topics. Nevertheless, they aren't nearly as fascinating as those one-in-a-million UFO-related letters one sometimes finds in the mailbox from a congressman writing candidly -- using words that simply astonish. For a brief time, one term I think, Central New York was represented by yet another member of Congress, Gary Lee. 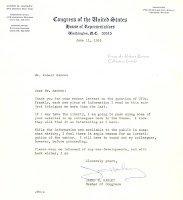 I wrote him about several issues at one point, and received a July 23, 1979 response of a seemingly typical nature. There's nothing surprising on page one, as you can see here, but page two presents another story of an obvious eye-popping variety. The Air Force -- the non-UFO, goodbye Project Blue Book Air Force -- looking into the UFO issue in some renewed, generally unknown manner? What? What? Had this tidbit appeared in a shady tabloid magazine, I would have relegated it to the trash heap, but this was coming from a member of Congress, and the wording was just too intriguing to pass up. Taking Congressman Lee at his word, I immediately notified APRO and others, but decided not to identify him as the source out of concern that he might be priviliged to information that might ultimately be withheld from him, should he be publicly named. Instead, I wrote a short article for APRO to print as a tip-off to other researchers. 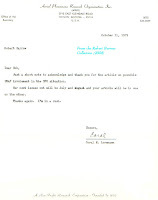 Coral Lorenzen was eager to publish it (see letter) and the piece appeared in the October, 1979 issue of The A.P.R.O. Bulletin. However, things aren't always what they seem. Or are they? In the next blog entry, I'll offer more about this situation and my further inquiry -- and I wonder to this day whether there was indeed more to this story than we'll ever know.